Opening an account here on KatersAcres.com is easy. There’s a few simple steps that you will need to follow in order to properly open your account. Here’s a brief tutorial about why you need an account of your tutorials, how to open your account, and how to shop on site. The answer to this is easier than you might think. Any tutorial that you purchase here on the website will be available for you to download in the future. You can download your tutorial right away after purchase, but you can also download your tutorial up to 5 additional times. What does this mean? It means that if ever your computer should crash or you should LOSE your tutorial, you can come right back here to the site, download it again, and you’ll be up and running with your tutorial. 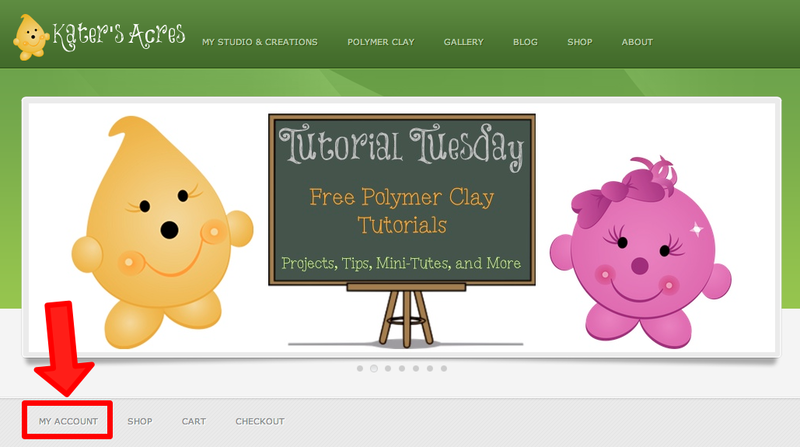 If you aren’t familiar with our Whimsical Sculpting Tutorial Club you can get more information here. Joining the Club will give you two PDF tutorials a month. Club members will be able to download their tutorials for FREE from the site by logging in and putting in their coupon code. This also means that Club Members can re-download their tutorials months or years after they are subscribed, simply by logging into their account. Like non-Club members, they will be able to download their tutorials a total of 6 times. In order to open a FREE account, first click on “My Account” from any landing page. This will take you to a Login Screen. Here you will have 2 options. The first to login to an existing account. The second is to register for a new account. Keep in mind that you will want to open only ONE account for all your tutorials. This means that no matter how many tutorials you purchase or get from the Tutorial Club they will all be in ONE place. As soon as you sign up, you will be sent an email welcome message. You can then go and log onto the site, add your shipping & billing information, etc. Now anytime you purchase a tutorial it will automatically go into your account. All you need to do to view purchases is click on “My Account” and there on the dashboard is a record of your past purchases, remaining downloads available, & a place to click on past orders. Please Note: Tutorials can be downloaded ONLY 6 times. On your FIRST download, please SAVE these tutorials to a safe place on your computer and/or print them out for future use. Once tutorials have been downloaded 6 times, they will need to be repurchased in order to download them again. Am I already signed up? I’ve been out of because of surgery and don’t know what I need to do to access my account. I ‘m a paid member. Where am I in the process? You’re good to go Kathy. Thank you!